"Use a chocolate with a high cocoa content for best results. Feel free to use whisky, orange liqueur or anything you fancy, really, instead of the rum. This recipe can be made per person, using one ounce of chocolate and one egg for each. This recipe contains raw eggs. We recommend that pregnant women, young children, the elderly and the infirm do not consume raw eggs." 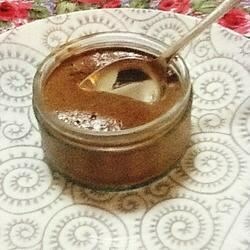 Melt the chocolate slowly in a double boiler over simmering water. Remove from heat and beat egg yolks into chocolate with electric mixer. Beat in rum, orange liqueur, or vanilla extract, if desired. In a separate bowl, beat egg whites to medium-stiff peaks. Stir a large spoonful of egg whites into the chocolate mixture to loosen. Then gently fold the remaining egg whites into the chocolate. Pour into serving glasses and chill in refrigerator until set, 4 to 5 hours. Will keep up to four days in refrigerator. Make your own homemade chocolate mousse—with a secret surprise. The choclate tasted burned and crusty. I do not recommend this recipe at all. Sorry! 2 stars! Really quick and easy. When I made it a second time, I decided to add some cream that I had as well - don't do it, it was FAR nicer without!! SUPER SUPER SUPER!!! Just like my grandmother used to make. I'd forgotten how easy this was to make. Delicious. This took about 5 minutes to prepare and it came out wonderful. For the people who said it was clumpy, you need to make sure you fold it really well. Do that and you have a treat. This mousse was great! VERY easy to make and it was delicious. All my friends loved it. Serve them in wine glasses with a little whip cream as garnish and they look awesome too!